Robust colour coordinated security shutters for your home or high security roller shutters for commercial or retail situations. Strength and security for all sizes of windows and doors our internal or external security grilles for manual or automatic operation. 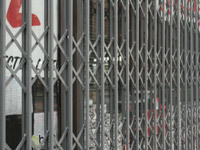 Fixed or removable bars for windows and doors of all sizes providing security and convenience. Protecting the boundaries of your property from unwanted callers, bringing an enhanced and safe environment for family or staff. 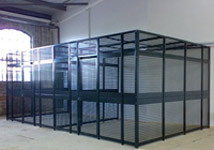 Modular cage and partitioning systems ideal for storage and security of high value goods and restricting or controlling access. Wide range of steel security doors, fire doors, communal entrance doors, utility doors and louvered doors. 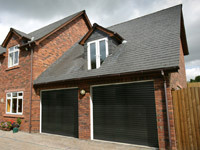 Insulated roller garage doors, manual or automatic for standard, compact or higher security installations. By visiting your premises we can discuss the most effective products and solutions to match your exact needs. We pride ourselves in our personal service supplying and installing a range of physical security products to protect you, your home or business, family or staff. 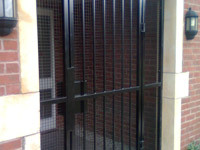 Whether you are looking for internal or external fitted security shutters, retractable security grilles, window or door bars, manual or automatic roller garage doors or individually designed metal gates and barriers, we specialise in preventing the threat of burglary or theft and detering the problem of vandalism to your property. We know the value you place on the security of your property and we strive to make our installations compliment your lifestyle and working practices with minimum interference to you. Our cost effective pricing with a great range of syles and colours create a balance between deterrence and aesthetics, providing you with an economical solution for the security of your home or business premises. Security Shutters - for home security or business and commercial steel shutters with the option of perforated or punched lath sections. Manual or electrically operated, ideal for protecting doors, shop fronts and windows. Insurance and Police approved roller shutters for security situations demanding the highest level of security. We also install shutters for bar servery, counter and receptions as well as fire shutters combining security and fire protection. Roller Garage Doors - manual or automated insulated electric roller shutter garage doors provide a convenient, space saving and secure alternative to standard opening or up and over garage doors. As well as are standard garage doors we install compact versions with smaller headroom, Seceuroglide Excel higher security garage doors and Vertico lateral closing doors. 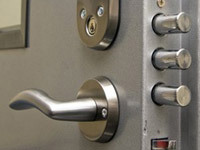 We have been providing security solutions to homes and businesses throughout Manchester and the north west since 2004. 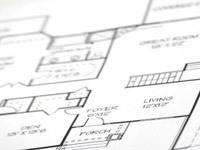 Our experienced fitters are also able to carry out competitively priced installations throughout the country. We look forward to using our expertise to help you with your security issues. As each security threat is unique to your property and individual circumstances I welcome your call for confidential advice and to arrange your free survey on 0161 630 9073 or 07940 549634. 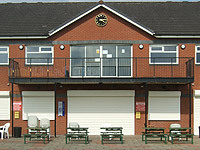 You can view some of our installations and activities on our News page and on Facebook. We are members of the Construction Industry Training Board (CITB) and accredited by the Contractors Health & Safety Assessment Scheme (CHAS) and achieved accreditation from Alcumus Safecontractor for our commitment to achieving excellence in health and safety. Staff hold current CSCS Health & Safety and Roller Shutter Installation Cards for the construction industry. We are also members of the Federation of Small Businesses (FSB). We are members of the Oldham Council ‘Buy with Confidence’scheme which are both managed by the respective Trading Standards Departments. First for security shutters, security grilles, retractable grilles, steel door installations, roller shutter doors, security bars, and roller garage doors Manchester covering Rochdale, Oldham, bar shutters Bury, Bolton, Salford, Stockport, Wigan, Saddleworth, Greenfield, Grotton, Urmston, Sale, Altrincham, Hale, Cheadle, Hazel Grove, Denton, Audenshaw, Hyde, Dukinfield, Stalybridge, Swinton, Prestwich, Whitefield, Radcliffe, Royton, Chadderton, Failsworth, Heywood, Marple, Bredbury, Romiley, Littleborough, Wardle, Eccles, Irlam and Bramhall. Specialists for installtion of roller shutters Manchester, Salford and Stockport.